I don’t eat red meat or pork and sometimes dinner can become boring with just poultry and seafood all of the time, so I’m always on the search for new recipes to keep our meals interesting yet delicious. 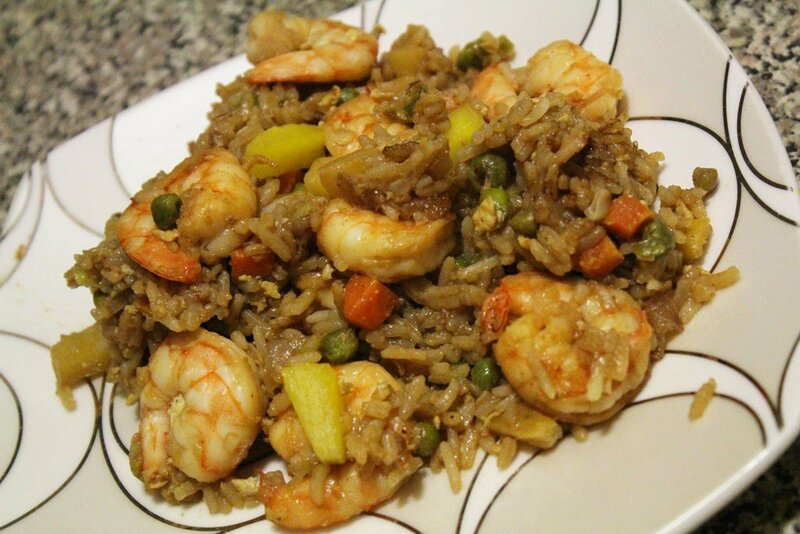 This Shrimp & Pineapple Fried Rice recipe comes from Taste of Home, but I doctored it up to my liking. I made it a few weeks ago and it was delicious. Since I’m planning on making it again this week I thought I would share the recipe with you guys so here goes. 1. Combine the soy sauce, hoisin sauce, sesame oil and cayenne pepper in a small bowl and set aside. 2. Heat a large nonstick skillet coated with cooking spray over medium heat. In a small bowl, whisk egg and add to hot pan, cook and stir until set. Remove it from the skillet and keep warm. 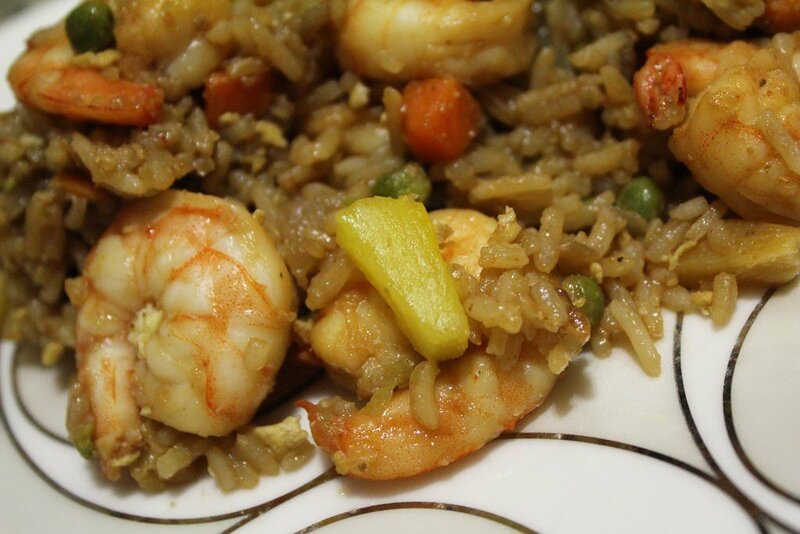 In the same skillet, add 1tsp of coconut oil and the shrimp. Cook until no longer pink, remove from pan and set aside. 3. Add the other tsp of coconut oil and the onion to the pan and sautee until tender. Stir in half of the pineapples and the carrots & peas and stir fry until no longer frozen. 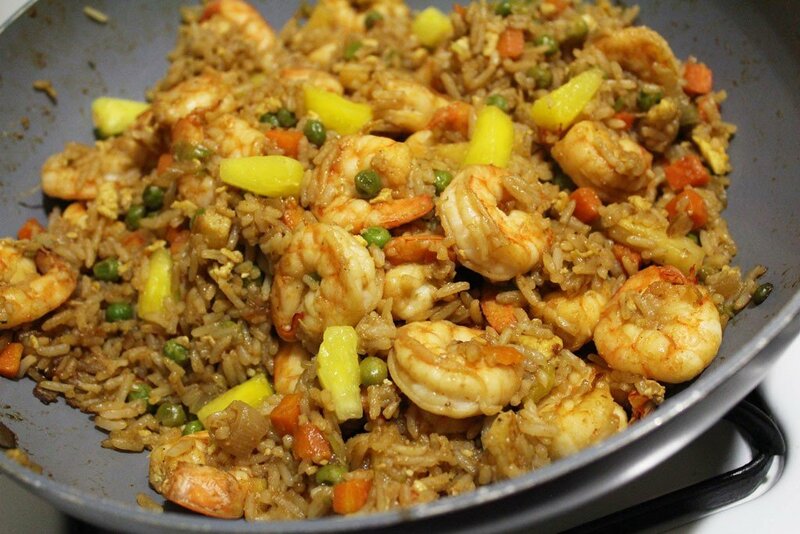 Add the shrimp and the rice and heat through. 4. Stir in soy sauce mixture, the eggs and the scallion. Add the other half of pineapples and stir fry until everything is evenly mixed and well heated. thanks for this, as a pescetarian, def not easy. You should try salmon meatballs! Just add salmon instead of red meat to a regular meatball recipe, it turns out delicious. I’ve tried this and love it. Very delicious. Thanks anyway! I am going to try this! Looks delicious!